MOJO® introduces a revolutionary method of creating motion on the water, with the MOJO® THRASHER which mounts a MALLARD MACHINE type motor and prop horizontally-to a specially designed pole to allow use in deep (up to 3 feet) or shallow water. 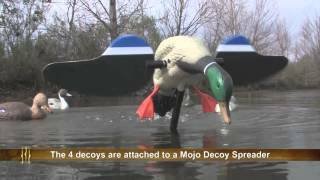 Generates extreme ripples and current to move decoys and delivers natural water movement sounds. Will help keep ice out of your hole. + Runs on marine type 12-volt battery (not included).